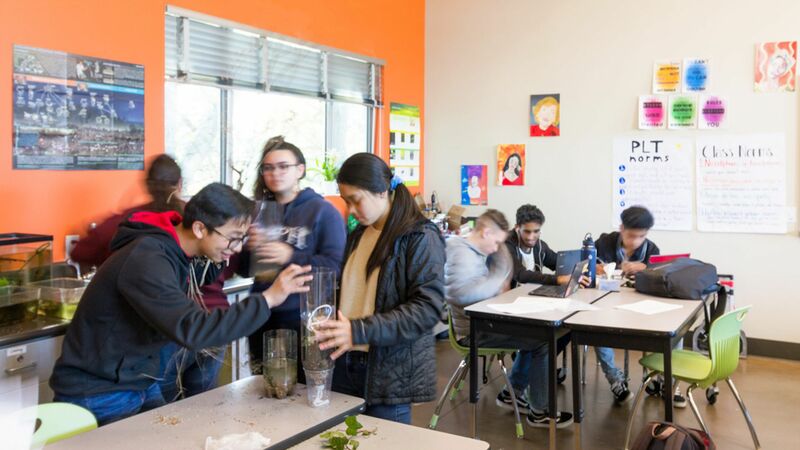 While reporting this story about high schools that are rebooting themselves to better prepare students for future jobs, I visited Summit Shasta, a charter school in Daly City, Calif., just south of San Francisco. There, I watched students in a science class assemble circuits and listened as English students read through a New York Times review before diving into a new book — Junot Diaz's "Oscar Wao." The big picture: As they worked, whiteboards displayed the skill each activity emphasized, like explaining evidence or modeling difficult problems. These skills are among the dozens that students track through an online hub — something like a custom Trello or Asana for school. This platform is at the center of students' lives. They use it to organize assignments, projects and goals. Caitlyn Herman, head of Summit's San Francisco Peninsula schools, says students are meant to learn three essential things: content knowledge, critical thinking and habits of success. These last two, she hopes, will get students better prepared for college and for work than if they were only learning traditional subject-matter knowledge. "You can't just know stuff," Herman told Axios. "You have to develop these attributes that are going to work well with people. You need to be able to create a plan and be flexible with that plan when things change." At the end of my visit, I met with three Summit Shasta students who talked about how they'd personalized their learning, choosing classes, projects and internships based on their goals. Josephine, a senior, said she wants to be a physician's assistant. She's lined up internships during the school year at a rehab center, and she spoke impressively about how her chosen field is likely to be transformed by AI and robotics. "I probably have to work more on communication skills," she said. Even if robots are increasingly involved in medicine, Josephine said, she will still need to work with physicians and patients.